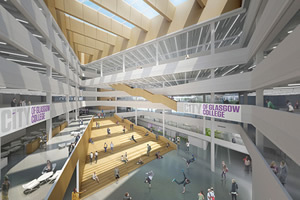 A £228m college is being constructed in the centre of Glasgow, on the banks of the River Clyde. The completed project will see a state-of-the-art college, realising its educational vision and provide the learning community with stunning facilities. The project started in 2013 and is scheduled for completion in summer 2017. The 70,0002 metre development is split over two sites, the Campus Site and the Riverside Site. 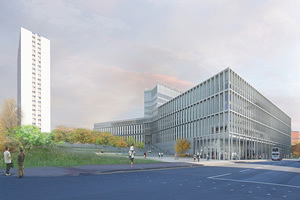 The new facilities will accommodate 40,000 students and 1200 staff, and have been designed to support learning and create an inspirational environment for educating the oncoming generations. Wireless networks will permeate each area, from the small library spaces to the depths of the surrounding landscapes, allowing students to stay connected, wherever they are in the grounds of the college. The potential usage for Armorgard products on this construction site is huge. Join us in our mission to make life easier for those on the tools. A unique piece of equipment, the LoadAll saves space, time and energy in every application. It is a unique tool, designed for storing and transporting plasterboard and other large sheets. Still the same great products, same superior quality, and the same level of outstanding service, but now packaged up in a stunning new look. At Armorgard we’ve kept the important things.